Softcover. An 82pp. 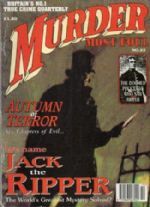 True Crime magazine, this issue being a Jack the Ripper Special featuring 4 articles : 'We Name Jack the Ripper' a personal view by Brian Marriner; 'Jack the Ripper: Six Chapters of Evil' by a contemporary journalist; 'The Doomed Policeman Who Saw Jack the Ripper' by Matthew Spicer; 'Was Jack the Ripper A Policeman?' by Bernard Brown. 82pp. 4to magazine format. Vg.